Just got back from California and I'm ready to get back to work on some new artwork. For those that didn't know, I spent the past week in San Jose teaching kids about Maya at iD Tech Camp. My students were very advanced and we got through a ton of content in such a short time. 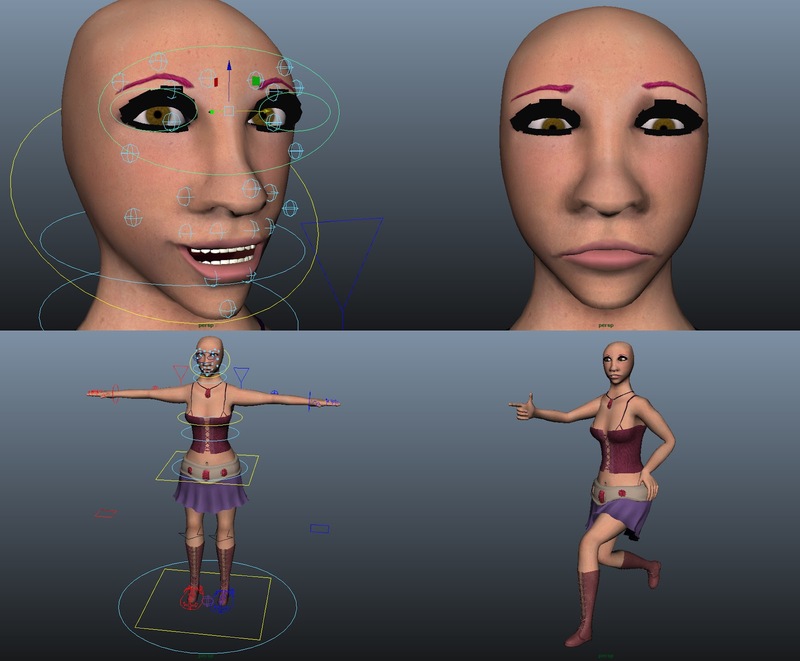 We went over modeling tools, animation, lighting, cameras, Mudbox, and even some UV mapping. And best of all, I got the chance to play with a 3D printer! It was a super fun week full of friends new and old, and now I'm even more excited to spend the summer at the iD Gaming Academy at Stanford. 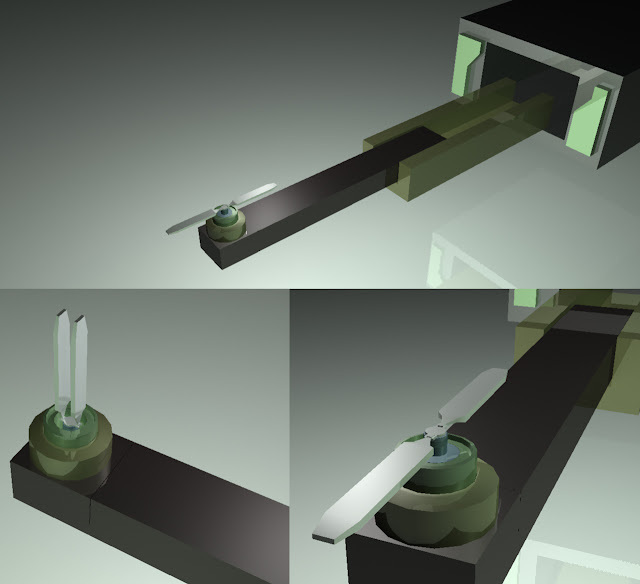 With this re-invigorated passion for 3D modeling, I got right back to work on my Haca Fairstalk project. I promised more frequent bite-sized posts so I'll keep this somewhat short. As part of the animation, Haca is running through this tattered junkyard doing all kinds of acrobatic flips and maneuvers. I wanted there to be some kind of conflict but creating another full character would be too time consuming. So instead I got the idea of some kind of small but destructive robots. I've been wanting to create more hard surface models with complex mechanical rigging, so an attack drone seemed like the perfect solution. I scoured the web for all kinds of references and came up with these sketches. 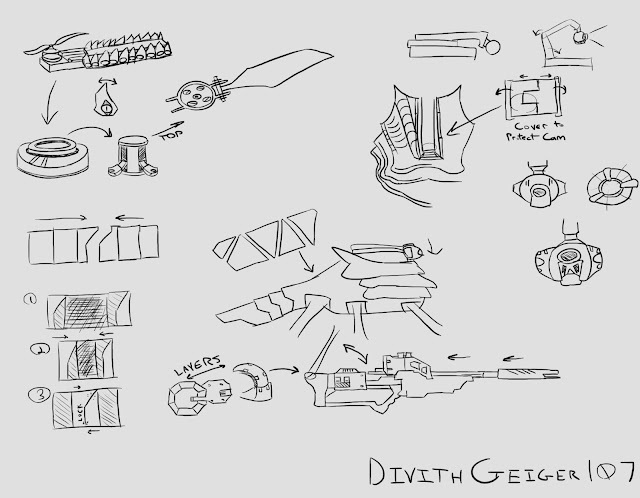 This drone is called Divith Geiger 107. I want it to have some elements of horror sci-fi while still maintaining believable mechanics. It has a hard layered shell on top which houses an eyeball camera on a crane. Below the body, it carries a high powered rifle for picking off its targets. After coming up with the design, I put together a prototype in Maya using primitive shapes. This is to help visualize some of the movements that the propeller makes. Here is a short playblast of the propeller retracting into the base of the drone. Probably going to scale up the size of the blades. Next on the agenda is creating primitives for other movable parts and then I can move on to the actual models for the drone. Next post should be a bit more visually appealing so look forward to that. Until next time... Adios! Hey guys, today I wanted to share a project that I've been working on for the past month or so. I've been transforming one of my existing characters into a 3D model, and I'm planning to create a short animated sequence of her. The end goal of this project is a full scene running in Unreal 4. It should be pretty cool, so I hope you'll stay tuned to check out all of my updates. I have a ton of images documenting various stages of the process, so this will be a pretty meaty post. For future updates, I think I might try making frequent bite-sized posts every few days to show my progression. With this project, I have a couple of major goals. For this character, I am trying my hand at a number of new current-gen techniques that big budget games usually use. 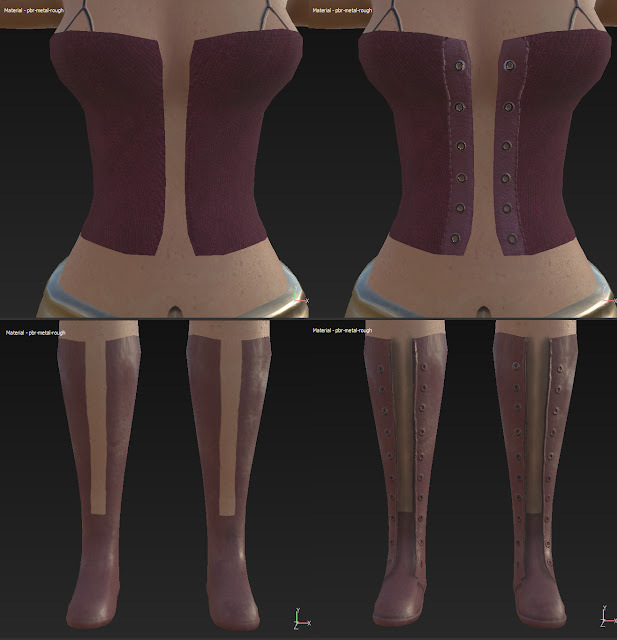 For starters, I wanted to utilize Substance Painter and incorporate a PBR texture system. That means roughness maps, metallic maps, microsurface, etc. I also want to shoot for a slightly higher polycount than I'm used to. 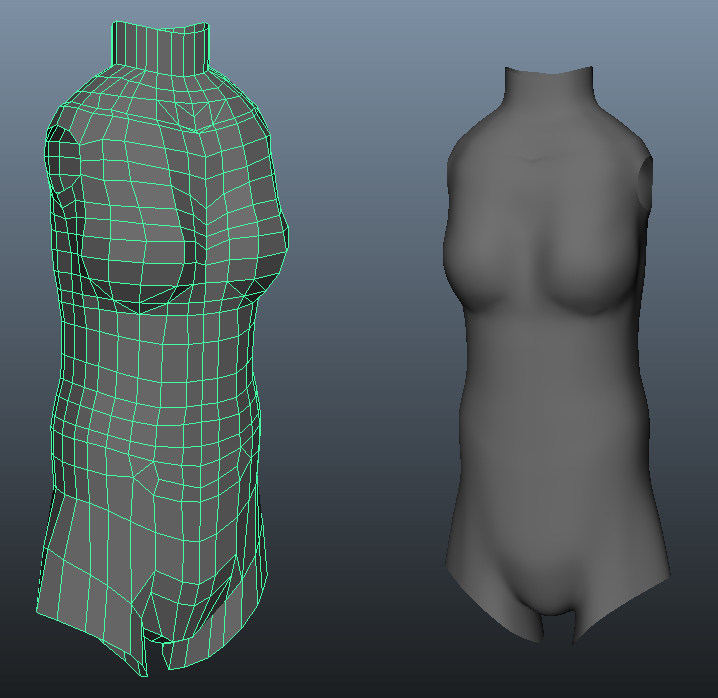 I was trained to be very restrictive with my resources, but as hardware evolves to accommodate higher polycounts, it's important to utilize those resources to improve the quality of your work. Currently I'm at 26k triangles without major accessories/weapons, so that's quite a bit higher than I'm used to working with. Additionally, this project will incorporate various physics techniques using Nvidia's GameWorks plugins. I learned a lot about APEX cloth physics on some of my recent freelance work, and now I'd like to add it to a project of my own. I have also been experimenting with HairWorks and plan to use that on the character as well. And of course getting it all working in Unreal 4 should be a good test of creating game-ready content. Without further ado, here are some of the progress shots. I started things off with a concept sketch. Luckily the character had been previously designed (including this awesome picture my sister drew), so this stage was mostly about getting the shapes down and creating a good reference. From there I modeled out the torso. I took extra care to properly capture natural curves and make sure that the edge flow followed the shape of the body. This step is incredibly important, and I'm very happy with how I created the initial geometry. Next I modeled the arms, legs, and face. At first, I felt some of these shapes looked too blocky and unnatural. Maya has some built-in sculpting tools that you can use to relax geometry, but instead I decided to toss the model in ZBrush to quickly smooth out some rough spots. I planned for Haca's boots and shirt to be directly built into the main model, so once I finished UVing, I quickly tossed on some stand-in materials to separate the clothes. It helps to visualize the finished mesh a little more than using that standard grey material. Next came the belt and skirt. 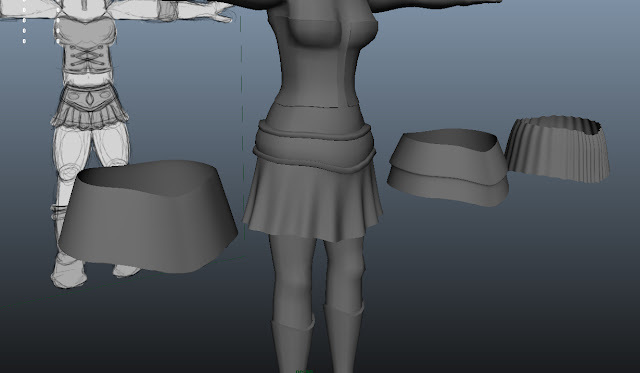 Since the skirt will be controlled with APEX cloth physics, it has to be its own separate model. 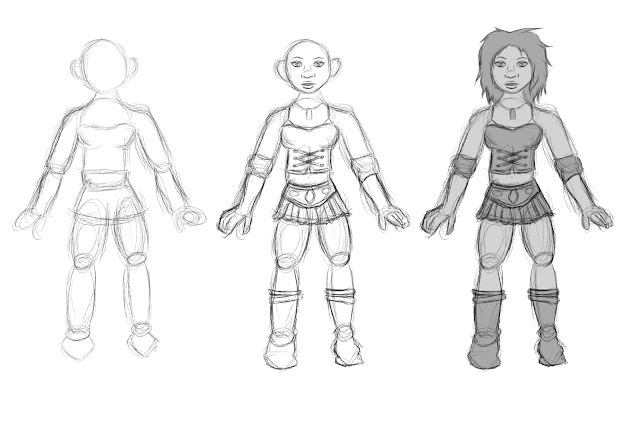 I experimented with a couple of different styles before deciding on that slightly ruffled look. 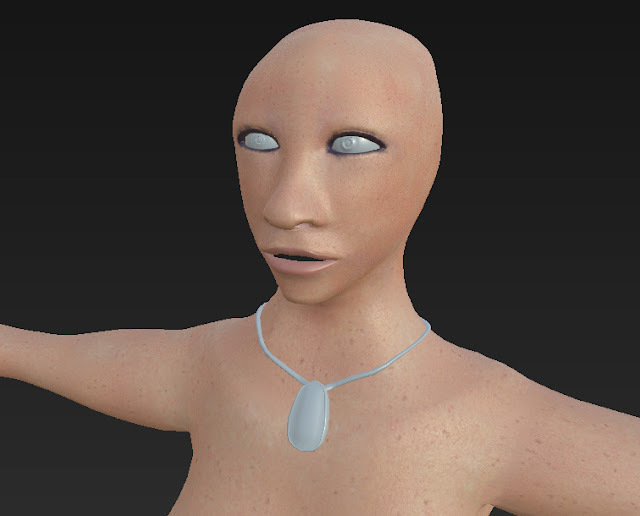 After modeling some jewelery, I took Haca back into ZBrush to add in some more details. You can see her collarbone and some of the muscles in her neck and abdomen now. I also did a lot of work on her face to make it less lumpy and more defined. For this stage I used a lot of references of real models. 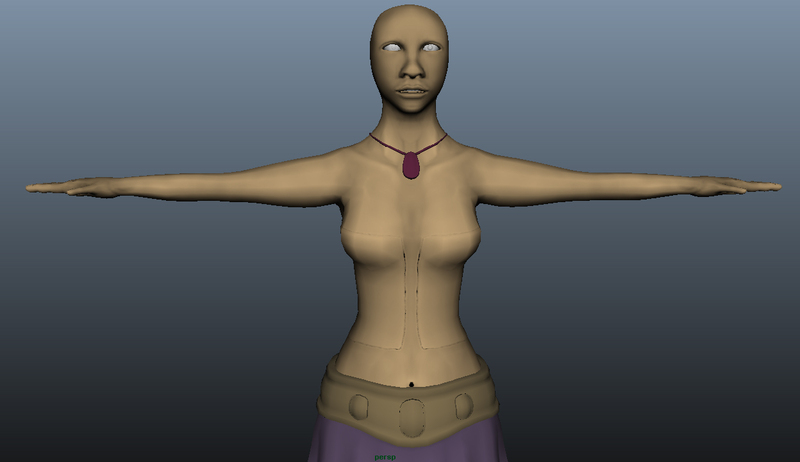 At this point, the model is ready for texturing. I took her into Substance Painter and started creating a skin shader. It's not super visible in this shot, but there is a subtle layer of roughness on the skin that helps to highlight the pores on human skin. I spent quite a bit of time in Painter to hammer out those details. From the fabric of her skirt to the edges of her fingernails, I really wanted to go all out to capture all of the minor aspects of a human character. 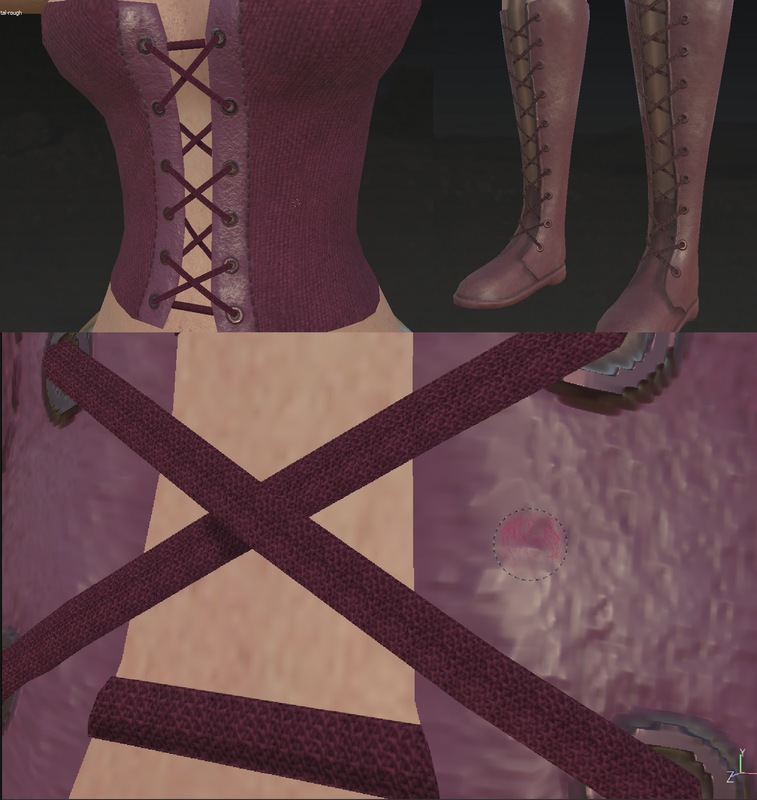 Those details are highlighted by things like lace holes on the boots and corset and various stitches and leather textures. I even made sure to give texture to the strings themselves, using height maps and painted shadows. These are details that you wouldn't really catch from a distance, but they add to the overall believe-ability of the model. For far too long, I was using a basic stand-in texture for the eyes. 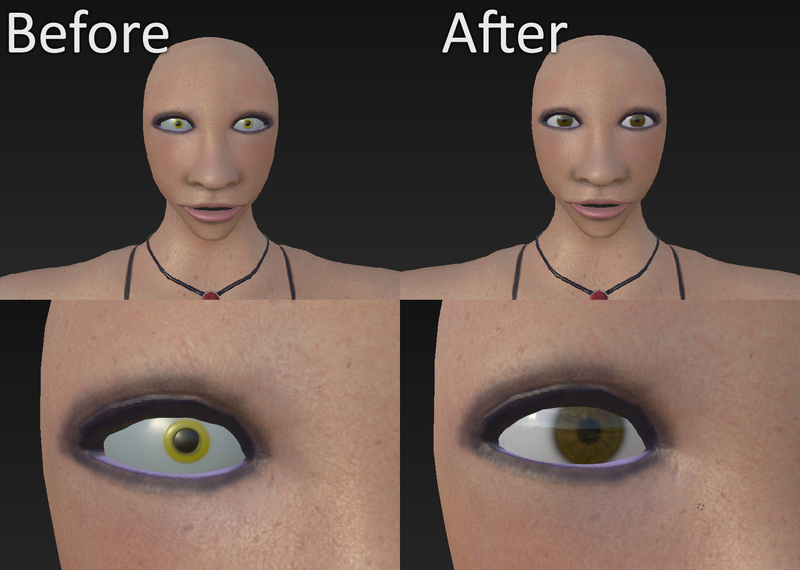 I think eyes are incredibly important in creating lifelike models and it is an area that I often struggle with. However with the added reflectivity and amount of detail that I painted into the cornea, I think I managed to shift this further away from the cartoony spectrum that I often fall into. 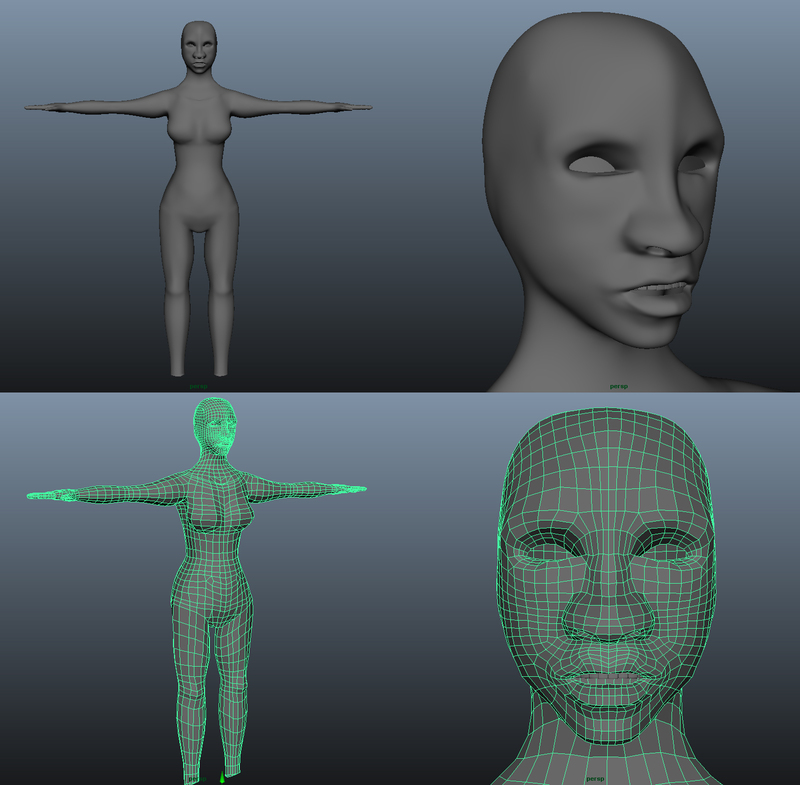 After finally calling the texturing done, it was time to move onto to rigging. To help speed along this process, I tried out Unreal's Animation and Rigging Tools. While there were still a lot of corrections to make and weight painting to do, the automation helped speed up some of the more tedious parts like plotting out the individual joints. There aren't a ton of interesting visuals to show for the rigging process, but now I can put Haca into all sorts of goofy poses! This is pretty much the current state of the project. 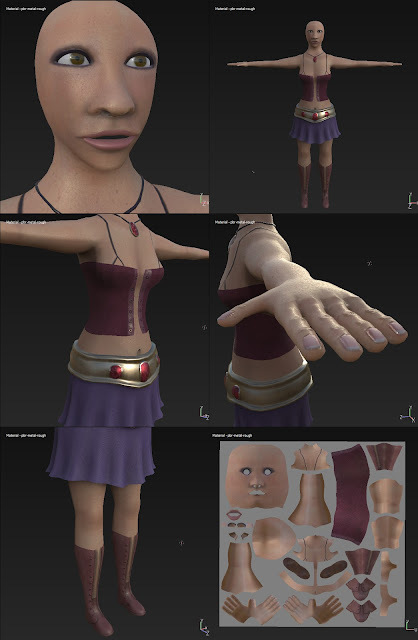 With the character modeled, UVed, textured, and rigged, most of the remaining tasks are animation based. I will be modeling a spear for her to use and then moving on to skirt physics and creating hair. I have already started gathering video references for a lot of her movements, so the next post should be fairly animated and exciting. I hope you enjoyed this glimpse into my character design process. This is one of my favorite personal projects I've worked on so far, and I'm excited to see it all come together in a big game engine. For the next 10 days or so, I will be occupied with teaching Maya classes at iD Tech (working at Spring Break Camp in California again this year! ), but once I return I plan to post more frequent updates of this project. Until then... Adios!